Amanda - Popular open source backup and recovery software. Amanda protects more than half a million servers and desktops running various versions of Linux, UNIX, BSD, Mac OS-X and Microsoft Windows operating systems worldwide. Apple Open Source - Open source projects at Apple. Black Duck - A leading global provider of products and services for accelerating software development through the managed use of open source and third-party code. code.NASA - Expands upon NASA's open source activities. The site surfaces existing projects, provides a forum for discussing projects and processes, and guides internal and external groups in open development, release, and contribution. CodePlex - An online software development environment for open and shared source developers to create, host and manage projects throughout the project lifecycle. Confederation of Open Access Repositories (COAR) - A growing association of repository initiatives and networks. COAR unites and represents more than 90 institutions worldwide (Europe, Asia, Latin America, the U.S. and Canada). DebianLinux.Net - A portal for interesting free software projects and software development in general. developer.com: Open Source Section - Articles, web resources and downloads. Developer Shed - Open source web development site. Document Foundation - An n independent self-governing meritocratic entity, created by former leading members of the OpenOffice.org Community, in the form of a charitable Foundation under German law. The Document Foundation is the home of LibreOffice, the next evolution of the world's leading free office suite. Drupal - An open source content management platform. Equipped with a powerful blend of features, Drupal can support a variety of websites ranging from personal weblogs to large community-driven websites. Dyne - A network and a free software atelier gathering artisans of different kinds. Produces free and open technologies and multimedia performances and workshops, researching the hybridation of various art and communication practices within the digital domain. Free Software (Open Source) - Free Software, as used in this web site, refers to oftware distributed in source form which can be freely modified and redistributed, or freely modifiable and redistributable software. Free Software is also referred to as Freed Software, Liberated Software (software libre), and (most commonly) Open Source software. Freecode - Maintains the Web's largest index of Unix and cross-platform open source software. GIMP, The - GNU Image Manipulation Program - a freely distributed piece of software suitable for such tasks as photo retouching, image composition and image authoring. GNOME - A complete free and easy-to-use desktop environment for the user and a powerful application framework for the software developer. GNU Project/Free Software Foundation - The Free Software Foundation (FSF) is dedicated to promoting computer users' right to use, study, copy, modify, and redistribute computer programs. The FSF promotes the development and use of free software - particularly the GNU operating system (used widely today in its GNU/Linux variant) - and free documentation. The FSF also helps to spread awareness of the ethical and political issues of freedom in the use of software. Greenstone - A suite of software for building and distributing digital library collections. Koha - The world's first free Open Source Library System. The Koha system is a full catalogue, opac, circulation and acquisitions system. Learning, Freedom and the Web - Anya Kamenetz and Mozilla have released a great book called Learning, Freedom & the Web. It details many of the activities and ideas generated at Mozilla's eponymous festival held in 2010, "a 500 person meta-hackfest that took place in a Barcelona city square." The free book features participant interviews, project highlights, photographs and blog posts from the festival, as well as related content from across the Web reflecting on ideas around learning, freedom and the Web. Linux - Linux distributions, forums, support, software, videos, news, and downloads. Mozilla - Coordinates the open source Mozilla browser project. Mozilla is an open-source web browser, designed for standards-compliance, performance and portability. Open Group, The - A vendor and technology-neutral consortium committed to delivering greater business efficiency by bringing together buyers and suppliers of information technology to lower the time, cost and risks associated with integrating new technology across the enterprise. Open Source Applications Foundation - Developing Chandler, a Personal Information Manager (PIM) intended for use in everyday information and communication tasks such as composing and reading email, managing an appointment calendar and keeping a contact list. It is free, runs on Windows, Macintosh and Linux platforms, and does not require a server or complex administration. 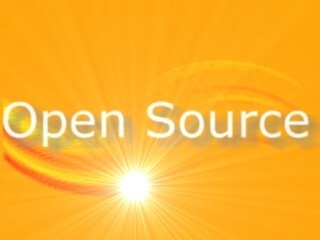 Open Source Initiative (OSI) - A non-profit corporation dedicated to managing and promoting the Open Source Definition for the good of the community, specifically through the OSI Certified Open Source Software certification mark and program. open.NASA - A collaborative platform for the open government community to share success stories and projects they are working on. The content on this site is written by NASA employees and contractors across the agency. OpenNTF - IBM collaboration open source community. GetOpenOffice - Training, consulting, and learning materials for OpenOffice.org and StarOffice. Major OpenOffice.org Deployments - Tracks public information on major OpenOffice.org deployments. OpenOffice.org Guidebook Resources - Templates and content for readers of the OpenOffice.org 2 Guidebook. OpenOffice.org Training, Tips, and Ideas - OpenOffice training, tutorials, and discussions. OpenSSL - The OpenSSL Project is a collaborative effort to develop a robust, commercial-grade, full-featured, and Open Source toolkit implementing the Secure Sockets Layer (SSL v2/v3) and Transport Layer Security (TLS v1) protocols as well as a full-strength general purpose cryptography library. The project is managed by a worldwide community of volunteers that use the Internet to communicate, plan, and develop the OpenSSL toolkit and its related documentation. openSUSE - A free and Linux-based operating system for your PC, laptop or server. You can surf the web, manage your e-mails and photos, do office work, play videos or music and have a lot of fun. openSUSE 11.4 provides all the tools and resources you need for effective home computing and computing on the go. It includes a complete, intuitive Linux desktop with a Web browser, instant messenger, e-mail client, photo catalog, word processor, spreadsheet, graphics tools, multimedia software, games and more. Its office suite is 100-percent compatible with Microsoft Office, and it also features the latest software for home networking, wireless support, Web hosting, virtualization, application security and software development. Project Harmony - A community-centered group focused on contributor agreements for free and open source software (FOSS). Project Harmony is made up of a group of industry interested parties, from companies, projects and those with personal interests in FOSS. It is open to all interested parties to join. Its initial goals are to avoid proliferation in contribution agreements across FOSS software projects where those organisations chose to work with contribution agreements. In doing this it hopes to assist organisations which use contribution agreements by providing standardised variable templates with clear and concise explanations; to come to a common understanding on these; and to recognise the relative maturity of FOSS by dealing with its internationalisation. It hopes to make it easier for organisations to have and use contribution agreements. It believes that contribution agreements should make it easier for developers to contribute regardless of who their employers are. Richard Stallman - An American software freedom activist and computer programmer. He campaigns for the freedom of software endusers to use, study, share (copy) and modify software; software that ensures these freedoms legally (via its license) is termed free software. Stallman opposes proprietary software which takes away a user's rights to exercise these freedoms through restrictive software license agreements, non-disclosure agreements, activation keys, dongles, copy restriction, binary executables without source code and thus forces its users into a role of dependence on a company that seeks to control and monopolize the users and the market via these restrictions.Also see Wikipedia. Softpanorama: (slightly skeptical) Open Source Software Educational Society - Resources for the independent study in computer science and programming with a special emphasis on scripting languages, one of the most important areas of the open source movement. SourceForge - A free service to Open Source developers offering easy access to the best in CVS, mailing lists, bug tracking, message boards/forums, task management, site hosting, permanent file archival, full backups, and total web-based administration. Ubuntu Linux - Ubuntu is a community developed, linux-based operating system that is perfect for laptops, desktops and servers. It contains all the applications you need - a web browser, presentation, document and spreadsheet software, instant messaging and much more. Ushahidi - A non-profit tech company that specializes in developing free and open source software for information collection, visualization and interactive mapping. Building tools for democratizing information, increasing transparency and lowering the barriers for individuals to share their stories. VirtualBox - A powerful x86 and AMD64/Intel64 virtualization product for enterprise as well as home use. VirtualBox runs on Windows, Linux, Macintosh, and Solaris hosts and supports a large number of guest operating systems including but not limited to Windows (NT 4.0, 2000, XP, Server 2003, Vista, Windows 7, Windows 8), DOS/Windows 3.x, Linux (2.4, 2.6 and 3.x), Solaris and OpenSolaris, OS/2, and OpenBSD. Backed by a dedicated company: Oracle. WhisperSystems - Open source security for mobile devices. Windows Sysinternals - The Sysinternals web site was created in 1996 by Mark Russinovich and Bryce Cogswell to host their advanced system utilities and technical information. Whether you're an IT pro or a developer, you'll find Sysinternals utilities to help you manage, troubleshoot and diagnose your Windows systems and applications. X.Org - The worldwide consortium empowered with the stewardship and collaborative development of the X Window System technology and standards. X.Org periodically provides official X Window System update releases to the general public free of charge. X.Org governs the evolution of the X11R6 specifications, working with appropriate groups to revise and post updates to the standard as required. This webpage last updated on Saturday, August 13, 2016 9:00 AM.